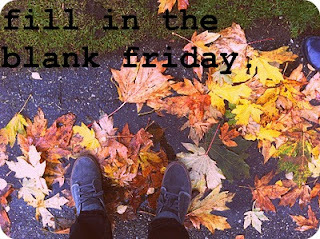 It's time for another fabulous Fill in the Blank Friday with Lauren at the little things we do. 1. When I was a kid I wanted to be a comedienne when I grew up. 2. As an adult, my dream job would be to appear on Saturday Night Live or be a world-traveling-photo-journalist. 3. When I was younger I wanted to be just like my brother. 4. The childhood Halloween costume that I remember most was when I was a clown. I wore a red turtleneck, black leggings, and I also had a perm. I think Mom made me a hat and painted my face. I was crushed this Halloween because my friend and trick-or-treat buddy Ali was Belle from Beauty and Beast. She wore the dress, complete with white gloves. I was totally jealous. I think the neighborhood felt sorry for me and gave me more candy. 5. My favorite childhood toy was a baby doll, named Rebecca. 6. The time I got into the biggest trouble when I was a kid was when I was mean to my little sister. 7. I get daily inspiration from bloggers, Etsy, and my Hubby.